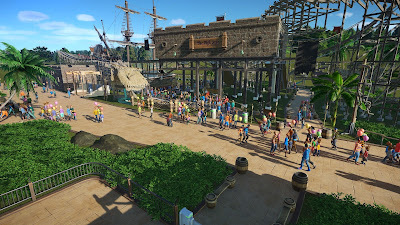 Pirate Cove is one of my favorite sections of my theme park Wonderland. 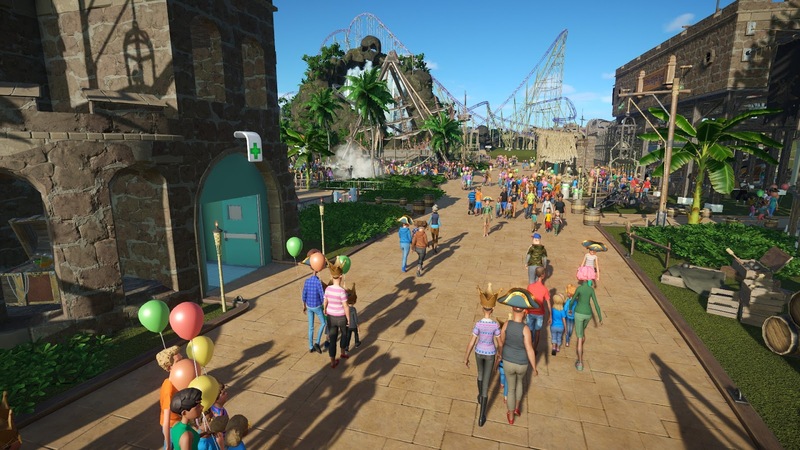 I spent a lot of time in this area, mainly because I ended up scrapping a ride and building new ones. 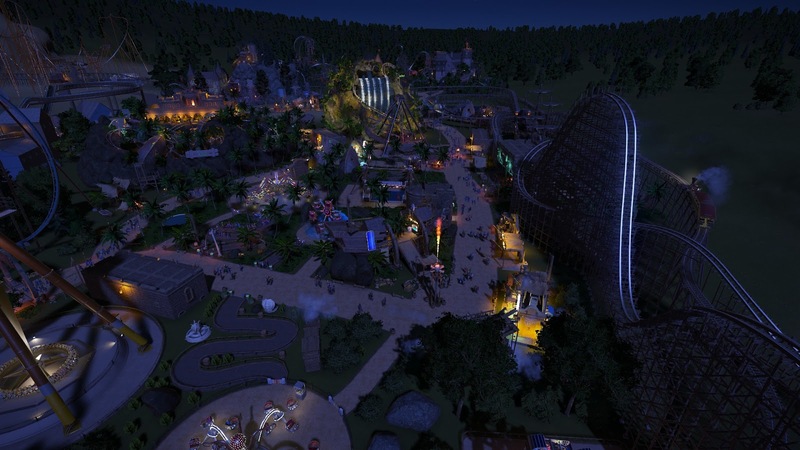 Also, I ended up adding a rail-way to my park because I found some open land in this section. So far this if my favorite section of the park. 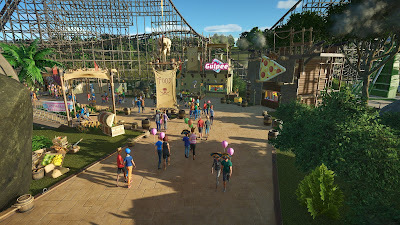 When you first enter Pirate Cove from the Fairy-Tale section you are greeted with either going left or right. 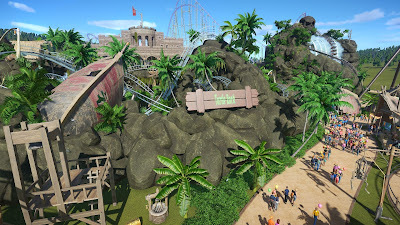 If you head left, you will end up going towards Turtle Rock, a roller coaster I downloaded from the Steam Workshop. 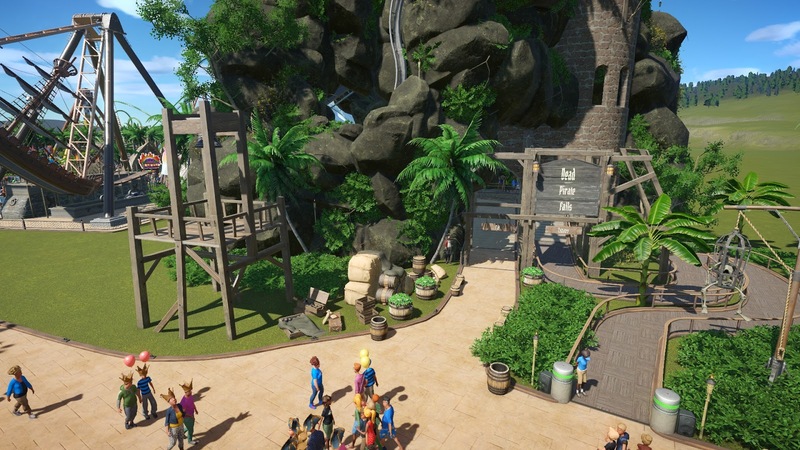 Turtle Rock was created by JONS90, and I thought it looked perfect for this section of my park. It looks amazing at night as well, so an added bonus there. If you head to the right, you will be passing by some of the flat rides in this section. Also, you'll be headed to the little food section that is in the corner before reaching another roller coaster The High Seas. 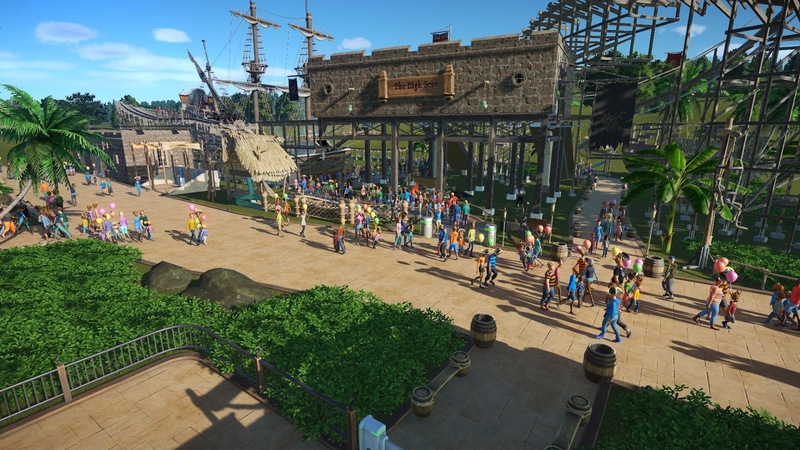 After passing The High Seas (which is a pre-made coaster in the game), you will end up heading towards another coaster created by a user on Steam Workshop. 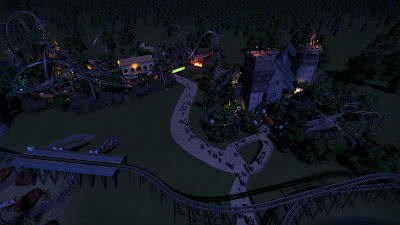 This roller coaster is called Dead Pirate Falls created by the user McDread. I loved the look and feel of this coaster so I just had to add it to Pirate Cove. Dead Pirate Falls was heading towards the back of the Pirate Cove section. 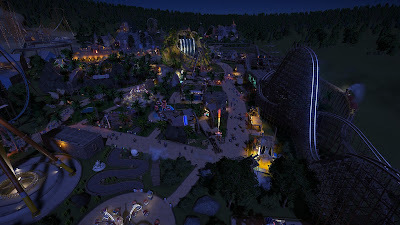 Back here I added a very very large coaster that you can kind of see in some of the screenshots already. I ended up not liking this coaster and had another idea. I found two more coasters that I loved on the Steam Workshop and ended up placing them in the spot that one huge coaster took up. 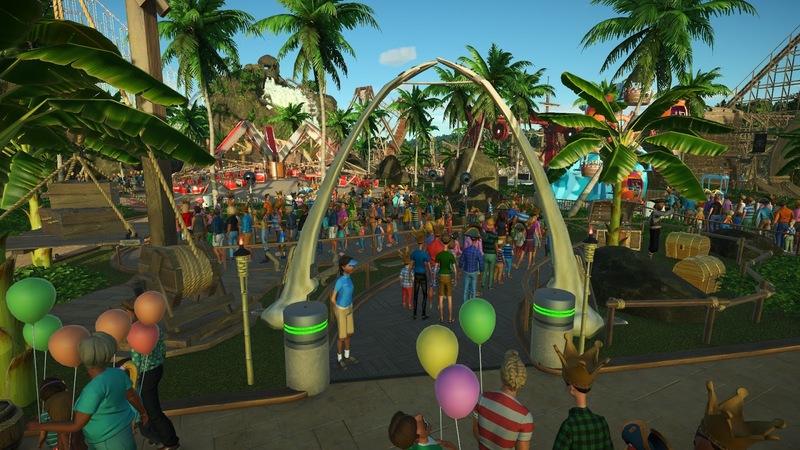 The Caribbean Curse created by McDread as seen in the back left of this screenshot above and Jack's Pirate Hideout by xepi88 were the two coasters I added instead of the one huge coaster I had there before. 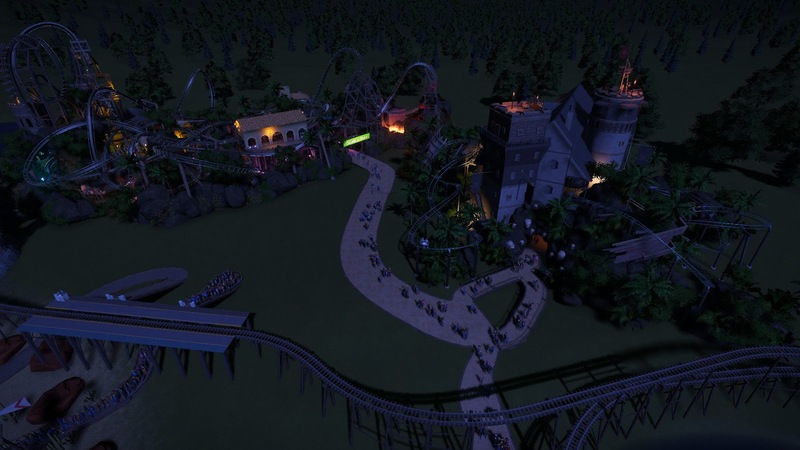 You can also see some of the rail-road I decided to add as well, called The Wonderland Express. It runs through a large part of the park and has four stops. The Wonderland Express also runs through a mountain in the back part of the map. That area is going to be the new section I have been working on called West World. 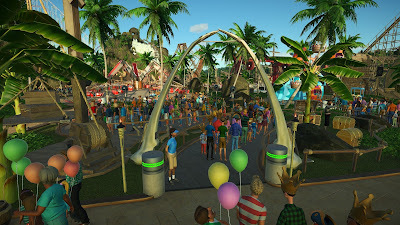 That is pretty much it for Pirate Cove, again I had the most fun creating this area and tweaking it to my liking. My next update on Wonderland will be my last. 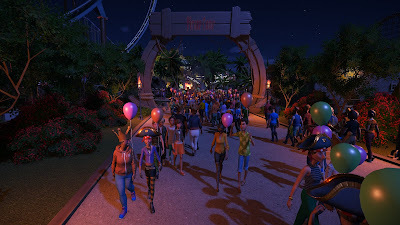 When I was starting the West World section of my park I found the game to get very very sluggish. I found that this game doesn't handle a lot of people in the park very well. So I decided to stop expanding even though I had more plans for other sections, but more on that in the final post. 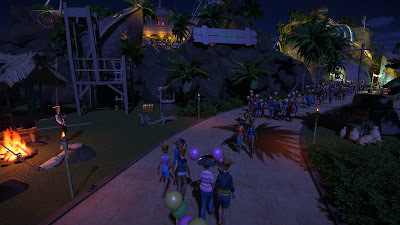 For now enjoy a night-time screenshot of the whole section of Pirate Cove and look for more screenshots I didn't use on my Google+ page. 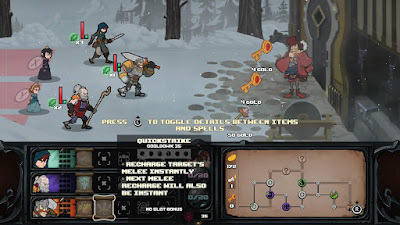 Has-Been Heroes is an action roguelike strategy game developed by Frozenbyte and published by GameTrust. It was released on the PS4, Xbox One, PC and Nintendo Switch on March 28th 2017. I'll admit, I only came across this game because it was a part of the Nintendo Switch bundle I pre-ordered back in January. But I ended up enjoying my time spent with the game. Has-Been Heroes is like none other game I have played before. The best way to describe it is it reminds me of The Darkest Dungeon. The reason for this is the fact that if anyone of your party members die, you have to start all over again. And you will die a lot in this game. At first this can be annoying, but once you get over it, the game becomes almost addicting. I found my self saying, just one more play through....five hours later I am still playing. The story of the game is rather simple. A rogue is on her way to the castle hoping to run into the heroes of legend. The warrior and wizard have been summoned to the castle for a task ordered by the King. Of course the rogue meets up with the has-been heroes and they agree to allow her to join them. The King then tasks the heroes with escorting his daughters to school, as the road there has been crawling with monsters. So the five of them set off on their journey to the school. Along the way an evil spirit sets loose many monsters to attack the Has-Been Heroes and thus the game begins. Each area is procedurally generated and the game starts off with only two areas to conquer. The goal of said area is to reach the boss and defeat him. Along the way you can run into merchants, camps, spell vendors, and treasure boxes. 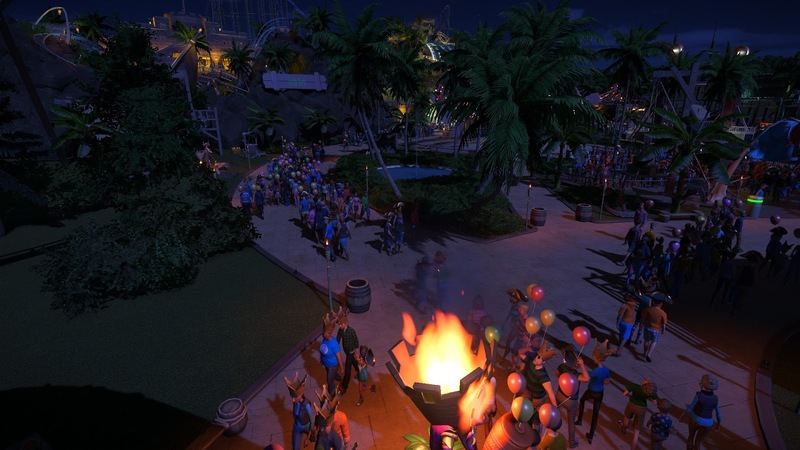 Each of these will have random items you can buy or find. Collecting said items can help you survive the many battles that you will have along your path to the boss. Once you reach and defeat the boss in an area, another area opens up and you guessed it another boss to kill. If you are successful in defeating both bosses the game ends and starts over from the beginning. This can also happen if any of the three party members die during your travels. Yup, you only get one life and once you die the game starts all over again losing all spells and items. A fresh start to say the least. 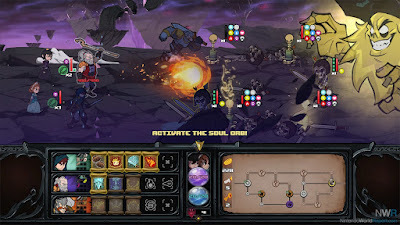 This may sound annoying, but like I said before once you die the first time or beat the first two bosses you quickly understand what Has-Been Heroes is all about. 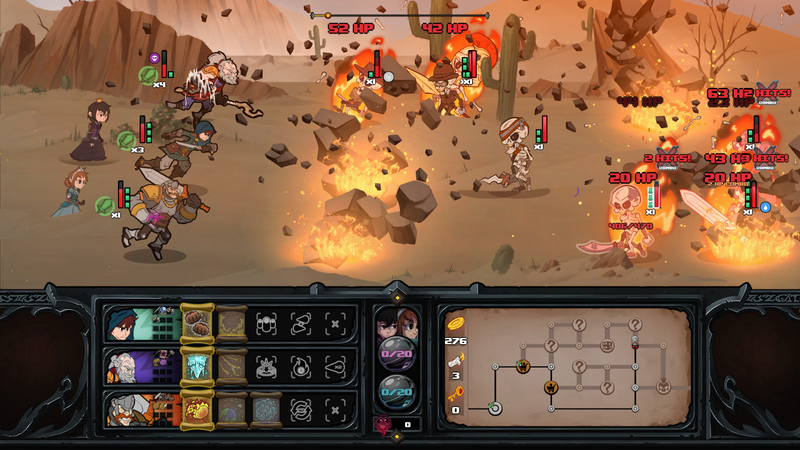 Tactics and strategy is the heart of this game. Plan your moves wisely, and take full advantage of the pause button. See, during any battle with the many enemies you can encounter or bosses you can fight, the combat is simple. The rogue gets three hits, wizard two hits, and warrior one hit. Of course the warrior is the strongest of the three and hits pretty hard. But items can help raise the damage of the other two party members. The interesting thing about the combat is when one party member attacks the game pauses, letting you switch party members and move them around the three lanes. How this helps is knowing the enemies that are attacking you down those three lanes. It is very similar to Planets vs Zombies. Enemies attack down all three lanes, and you can move your party members depending on which ever enemy is closest. But the strategy is to match the party member with the enemy of similar stamina. Monster's can have a range of stamina from one point to five points. What you want to do is switch around your party members to knock out the stamina matching their attack number and then switching in another party member to deliver the final blow. If done correctly, you can combine some deadly combos this way. So it is always best to plan your moves and attacks. Of course the game doesn't make this easy. It throws in some randomness to make things harder and thus ends up with you dying a lot. Though, dying is ok in this game. See, whether you die or defeat all the bosses your reward is unlocking more Heroes, Items, Monsters, and Areas. To unlock these you must collect souls, and souls are only collected by fighting the battles in an area. So if you mess up or the RNG is unfair, the souls you collected are totaled up and you see what you have unlocked. Starting over from the beginning is not so bad, because now you have more chances of getting better items in which you just unlocked during your next play through. It is hard to describe, but once you play this game it can become very hard to put down. You'll always end up saying to your self, just one more time and then before you know it five hours have past. 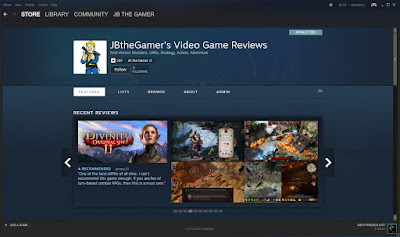 At first glance it may seems there is not much to this game. Go through random areas, fight monsters, collect souls, die or defeat all the bosses and then rinse and repeat. But the more you unlock, the cooler the items become and monsters you fight. Adding to the challenge of the game. Overall the game is fun and can get pretty addicting at times. I found it hard to put down once I picked it up. But the RNG can be very unfair at times and can leave you demoralized. I really liked the combat style, it is unlike any I have seen before. 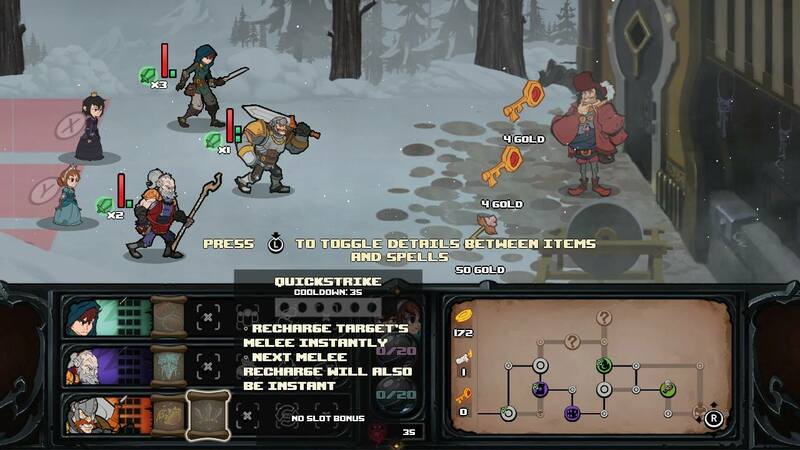 If you are looking for a roguelike strategy tactics game, then pick up Has-Been Heroes. Its fun for what it offers and for $20 it can't be beat.